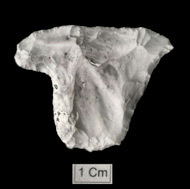 Flint and chert artefacts have been picked up from molehills and rabbit holes around the Dales for many years. 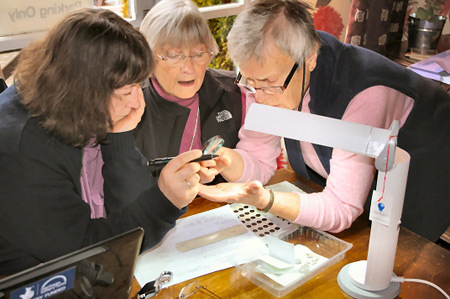 Craven Museum holds a collection of over 50,000 artefacts collected by John and Bob Richardson, each with its find location recorded and with a preliminary identification. 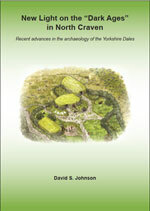 The project examined almost 600 artefacts from one site to the north of Grassington, compiling a detailed catalogue that can be used in the future to compare evidence from different locations. 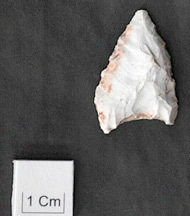 Neolithic pottery has been found at some of the lithic scatter sites, but further work is needed to understand the progression from temporary hunting sites to permanent settlements, where scrapers such as this could be expected to be more common. 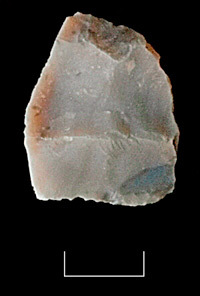 Polishing flint or grinding edges to a smooth finish as in this example is a Neolithic technique comparable to the production of stone axes, fragments of which are often found on lithic scatter sites. 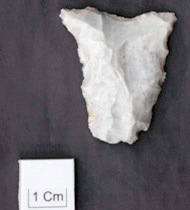 Several examples of denticulated edges were noticed, some created by regular and pronounced notches. 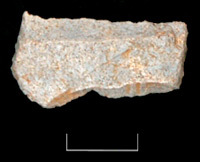 Despite their apparent fragility, these thin saw-like edges are capable of cutting bone or wood. 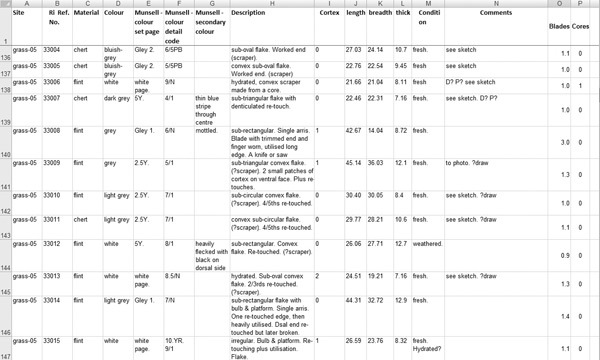 Sometimes the identification of formal tool types does not tell the whole story. 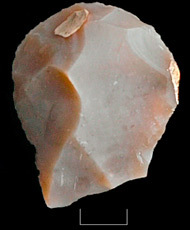 This ‘double-ended scaper’, a small piece of chert deliberately blunted by steep retouch at each end, is likely to have been worked so that it could fit end-to-end with others in a composite tool such as a sickle.